When writing for communities, journalists often find themselves juggling two seemingly contradictory roles – in one hand, the role of independent watch dog and in the other, the responsibility to serve as guide toward common understanding. According to “America’s Best Newspaper Writing,” reporters must find a way to effectively balance these two roles, capturing the best aspects of the old and new. It captures the simple humility of an 87-year-old laundress, seemingly unaware of just how significant her actions are. Bragg tells the life story of Oseola McCarty, the elderly woman who donated her life’s savings to a university, with powerful detail. As a local reporter focused on a particular beat, spending time in the books is important, providing a base of knowledge that will simply enhance your reporting. “Washington Post” columnist Thomas Boswell has discovered the importance of become a scholar within a beat. It was his desire to learn that contributed to his article titled “Losing it: Careers Fall Like Autumn Leaves.” His story about the tragedy surrounding the end of professional baseball player’s career has live due to his use of literary elements and depth as a result to his substantial knowledge. 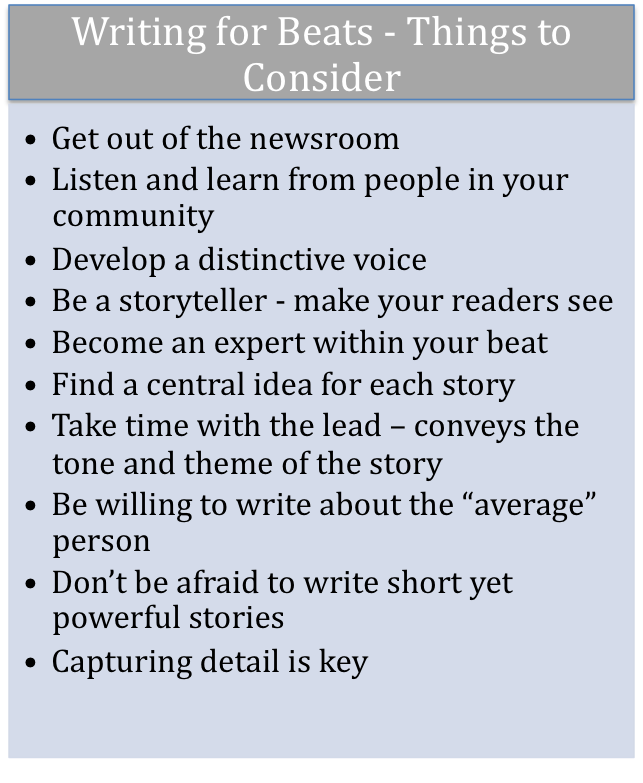 In order to learn how to improve your skills as a journalist, writing consistently is important. However, reading exceptional writing is also key, and five Pulitzer Prize winners and finalists provide examples of beat and local reporting at its best. Watchdog reporting at its best, Chuck Philiips and Michael Hiltzik story titled “Hotel Detox: For Affluent Addicts” exposes the shortcomings of many rehab programs housed in five-star hotels. With its use of specific detail and anecdotes, as well as a powerful lead, 1998 article leaves readers wanting to know more. “For I have Sinned,” a 1995 article written by “Newsday” reporter Bob Keeler, is an effective example of a local story that is expanded upon in order to portray what is taking place on a national level. Keeler uses the story of a young woman named Perri Caldera to highlight progressive changes within a local Catholic parish. He took the time to interact with Caldera, as well as other community members. Exposing the failures of the Vermont state mental hospital, Ellen Barry’s “Mental Breakdown” showcases the power that can be found in the first few paragraphs of a story. The first four paragraphs offer the shocking issues found in the hospital, while the rest of the story discusses the contributing factors. It is the lead that draws in the audience, and Barry captured that beautifully. Celia W. Dugger is a reporter who has extensive knowledge about immigration. Currently a “New York Times” foreign correspondent in South Africa, Dugger spent several years writing about, not only immigration legislation, but the people affected by it. In a story titled “After Crime, She Made a New Life, but Now Faces Deportation,” Dugger tells the story of a woman facing deportation to Vietnam. It is her knowledge of immigration law and issues that gives this story depth. The story of 8-year-old Jack Streeter, told in 2004, is one of heartbreak, challenge, and hope. Due to its depth and detail, it is clear that “The Wall Street Journal” reporter Amy Fockser Marcus took herself out of the newsroom and into the life of the Streeter family. “After Lukemia, Family Struggles to Define ‘Normal‘” is an example of how compelling stories can be when reporters take the time and effort to get out and interact with community members. I like the format of your pull-out graphic, Kellye! You have a typo in the headline, though. Also an error in the item that is second from the bottom on the list. Check it out and fix it. The one no-no in graphics is to make errors in them, because they stick out like a sore thumb! Also, if you move the graphic over to the right side of the column it will not land right under the subhed and it will be better placed so readers do not think the subhed has something to do with your graphic.